I've knit several of the caps before, but this was the first time I'd knit with the Yarn Bee brand (Hobby Lobby). The skein contains 76 yards, and I thought it would be enough to knit a medium/large cap, and it nearly was. 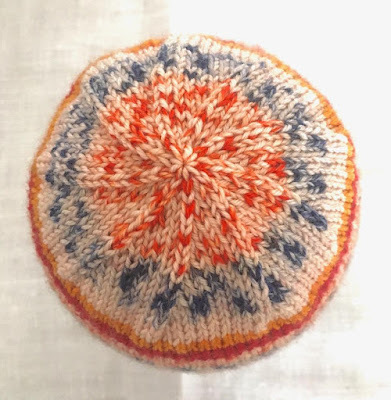 The pattern is easy - just plain knit in the round for six inches and then begin decreasing. I was on the sixth row of decreases when the tail of the yarn came into view over the arm of my knitting chair. Tinking back is impossible with this hairy yarn, so I to make some adjustments and began decreasing more quickly. In the end, it didn't change the appearance of the hat, but it's probably a half and inch shorter. After knitting the hat/cap is turned inside out so the smooth knit side is worn next to the head. Now that I'm aware of how the yarn knits, the multi-colored skein, shown above, will become a size small/medium cap and shouldn't need any last minute adjustments to the pattern. 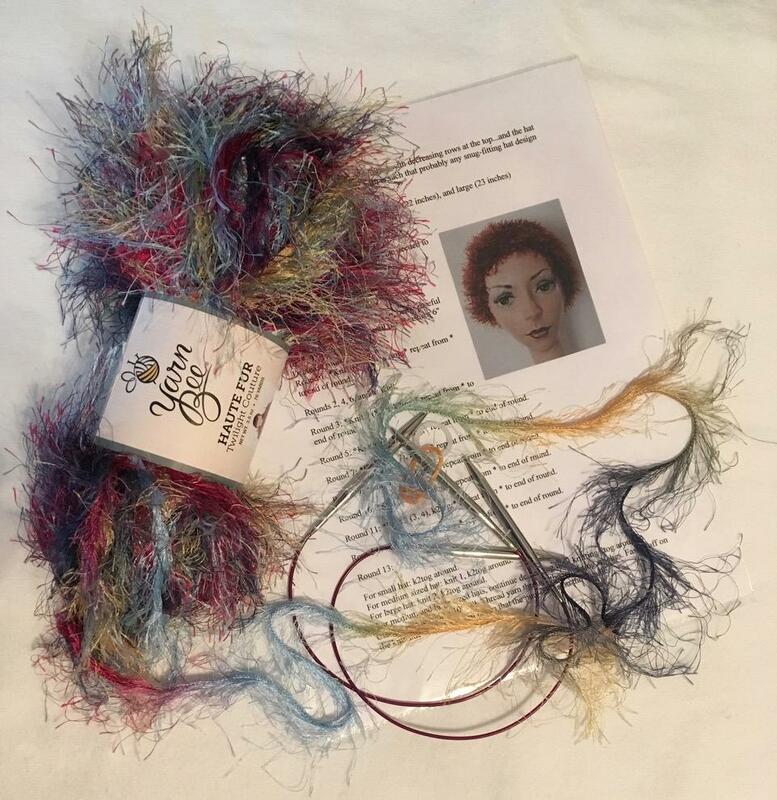 I recommend this yarn for knitting the "No-Hair-Day" cap because it doesn't require attaching a new ball/skein of yarn, and the "hair" fibers are much longer than the Lion Brand Fun Fur yarn I've used; thus, creating a more realistic and thicker head of "hair." 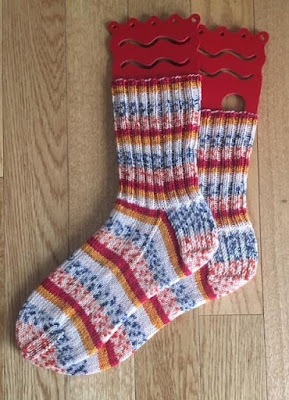 Do you like knitting with eyelash, novelty yarn? 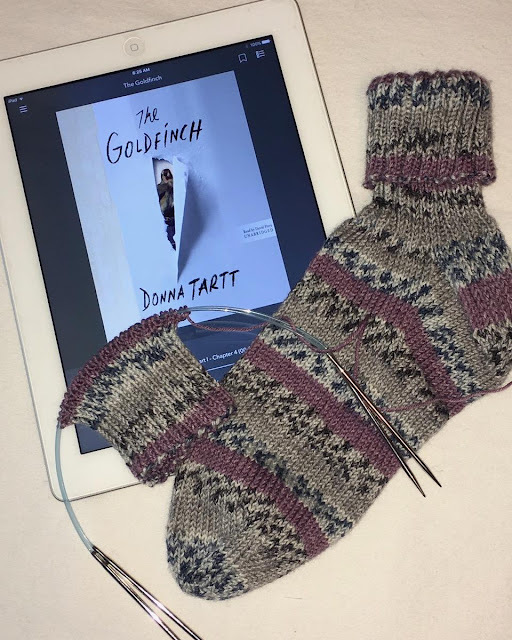 I can't remember whose blog post recommended Donna Tartt's book, The Goldfinch, but I liked it. It is a compelling and sometimes dark story. The plot gets bogged down in several places with unnecessary explanations: in my opinion, large sections could have been cut without changing the story. Be aware, that this book uses the "F" word liberally. 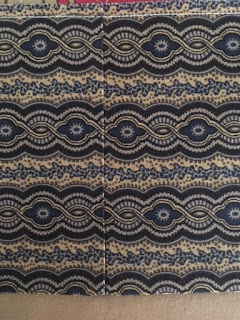 Sewing and knitting are wonderful accompaniments to audio books: another pair of socks will soon be finished. What book(s) do you recommend that I add to my book queue? I am aware that businesses have to be creative to be successful, but using deceptive tactics is not acceptable to me. 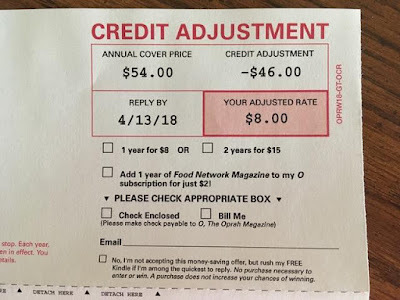 A "credit adjustment" document (portion of it shown above) arrived in the mail from a marketing group for O magazine. I haven't subscribed to this publication for at least two years (I can read it on my iPad using the public library app), and do NOT have a credit balance. 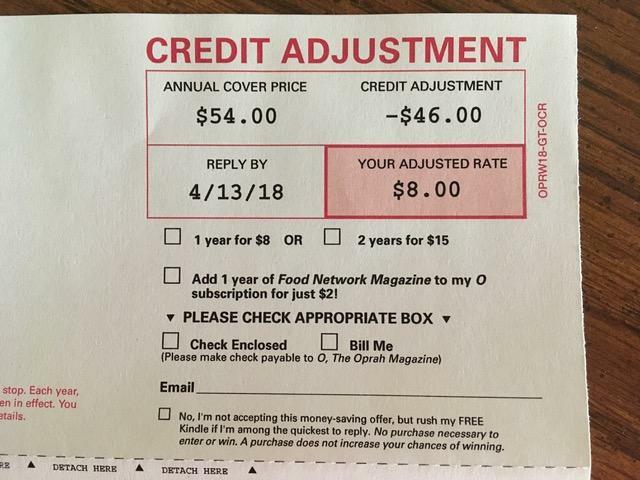 The statement states the magazine is $54 annually and my "adjusted rate" is $8 because of all my "credit." A bit of online research clearly shows the annual subscription rate is $15. The $8 rate is a great deal, but why would the publisher resort to such deceptive tactics? I have become cynical: I question every piece of mail, every phone call, every email, every interaction. Do you? 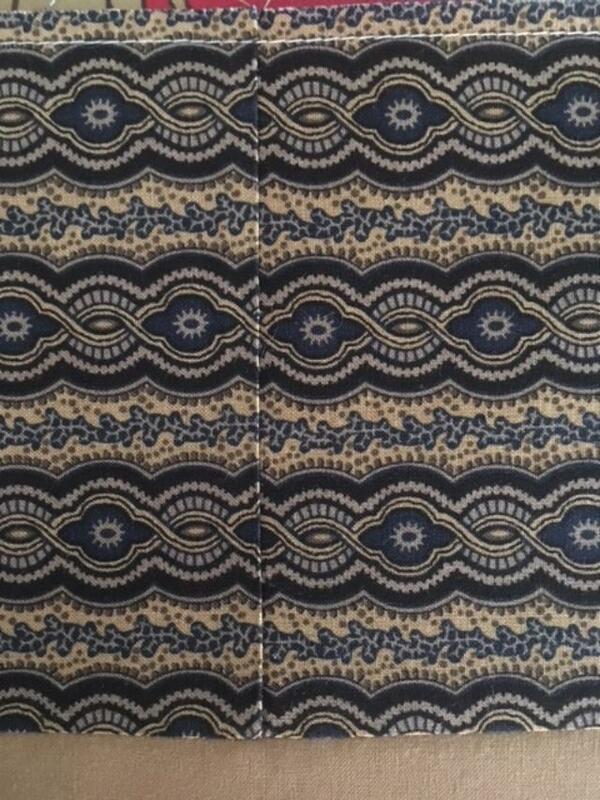 This panel has been in my stash for a long time and was added to my UFO challenge list to be completed this year. 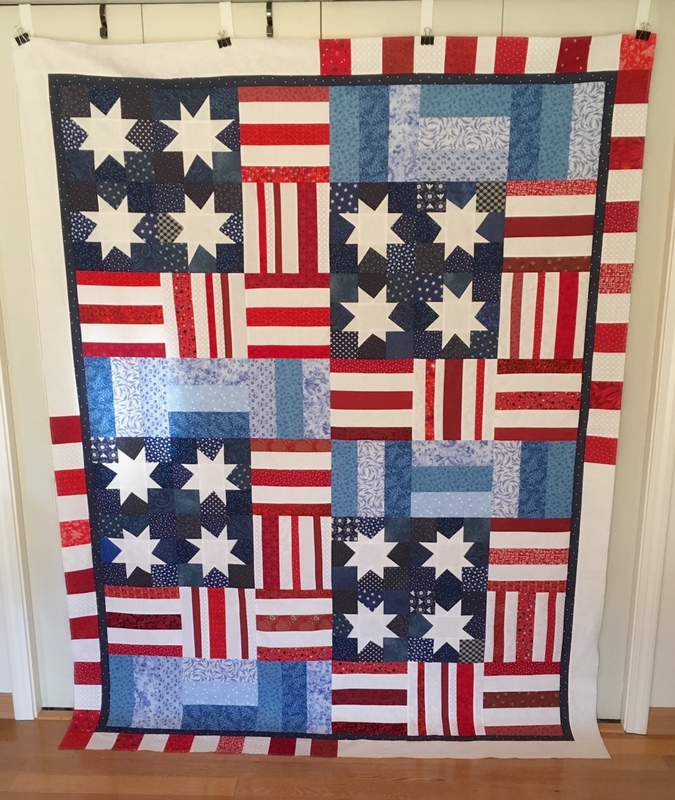 Horizontal panels can be a challenge, so I searched Pinterest for ideas and discovered this pattern that highlights and complements the panel. One of my goals this year is to knit at least one pair of socks a month. 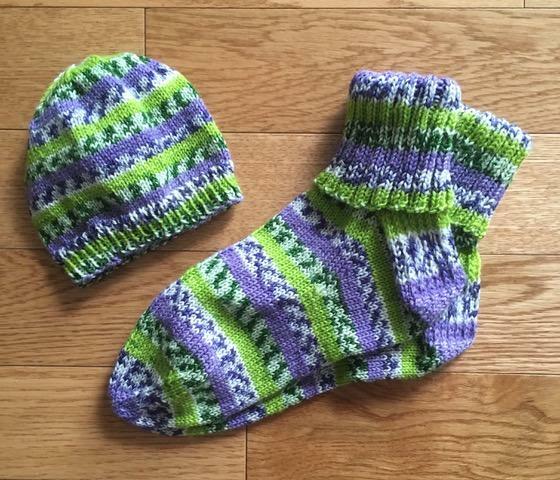 Last week, these colorful socks were finished, and I knit baby hat with the remaining yardage. Only a tiny bit of yarn remains. Doesn't this colorful yarn (Cascade Yarns - Heritage Prints #04 - Iris) remind you of Spring and Easter eggs. 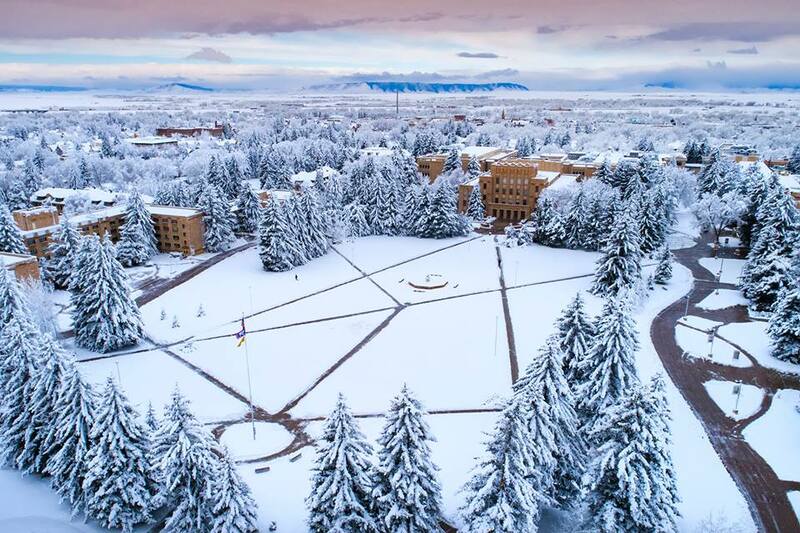 Seeing this photo of Prexy's Pasture brought back memories of my two and half years at the University of Wyoming. I can't begin to count the number of times I trudged across Prexy's Pasture on my way to classes at UW in the early 70s. The wind was often howling and drifting snow across the open space in the winter. Cold nights in the spring would turn the sidewalks into treacherous ice corridors. One early morning, I fell so many times, that I finally took off my shoes and walked in my socks to get to class on time. The pine trees have grown a lot since the early 70s and probably buffer some of the brutal wind and reduce how much the snow can drift in the area. In the summer, the campus is gorgeous with green spaces and blooming flowers. The UW campus has expanded so much that it is clearly more than double what it was in the 70s. The only part that hasn't changed much is the area around Prexy's Pasture - the site near the original UW campus. According to Wikipedia, Prexy's Pasture is a large grassy area located within a ring of classroom and administrative buildings and serves as the center mall of the campus. The name is attributed to an obscure rule that the university president, or "prexy", is given exclusive use of the area for livestock grazing. During the administration of Arthur G. Crane the name, "Prexy's Pasture", was formally declared. 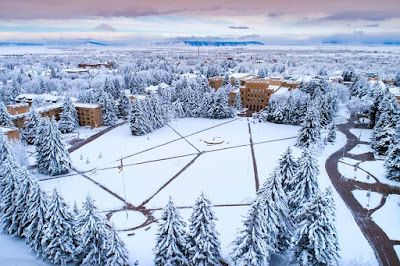 Prexy's, as it is often called today, is also known for the unique pattern formed by concrete pathways that students and faculty use to cross the pasture. 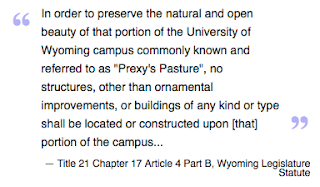 When the University of Wyoming first opened its doors in 1887, Prexy's Pasture was nothing more than an actual pasture covered in native grasses. The football team played their games on the pasture until 1922, when Corbett Field opened at the southeast corner of campus. Over time, as the needs of the university has changed, the area has been altered and redesigned. The original design was established in 1924 and in 1949 the area was landscaped with Blue Spruce and Mugo Pine. In February 1965, the Board of Trustees decided to construct the new science center on the west side of Prexy's Pasture. The board president, Harold F. Newton, who was concerned about the location, leaked the decision to the local press. The uproar that followed caused the board to decide on a new location for the science center and resulted in a new state statute making it necessary for any new structure built on the pasture to receive legislative approval. The final clue to the mystery was released last Wednesday, and by Saturday, the pieces were sewn together into a quilt top. 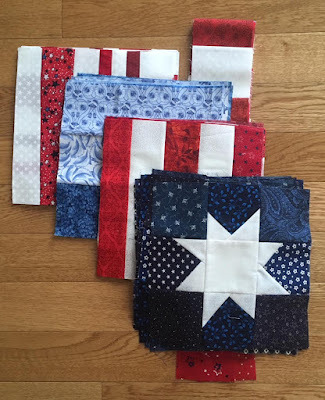 I think the design would be more pleasing to the eye if all the red and white striped blocks were going the same direction to resemble a flag. On Saturday, I found some appropriate squares and orphan four-patches in my scrap bins and made four doll quilts for A Doll Like Me (Facebook link) project. 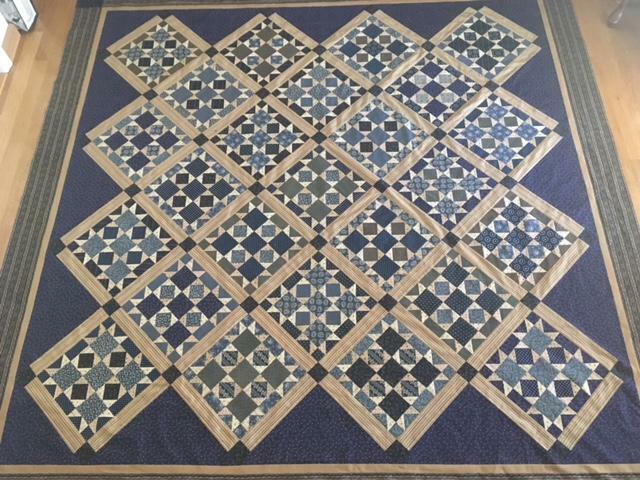 I learned about the project from Mary's blog (Making Quilts from Stash) and followed the link to Needle and Foot. I am too late to join Bernie's collection drive, but I decided to make a a few dolls quilts to send on my own. 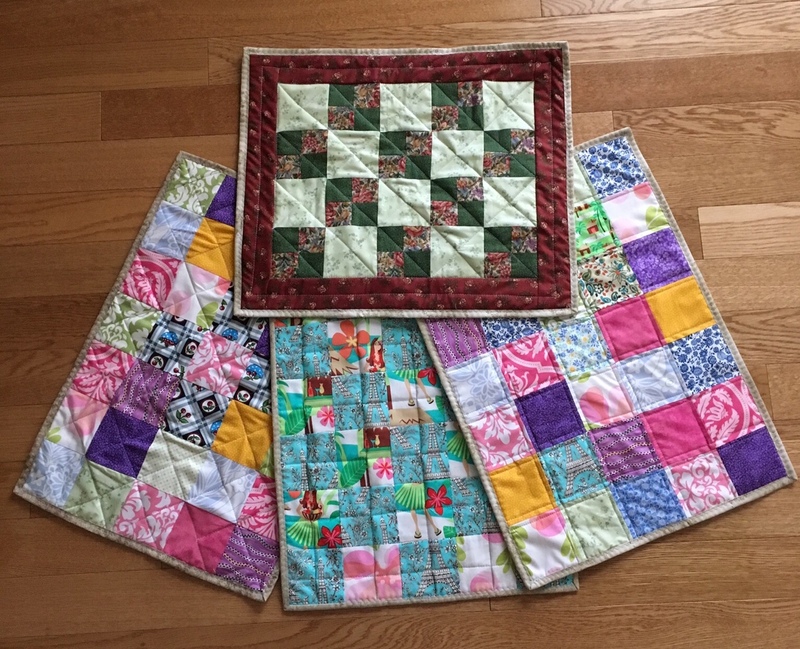 The four little doll quilts and the Sunbonnet Sue doll blanket are in the mail. The dolls that Amy makes are created to match their owners and their special needs. 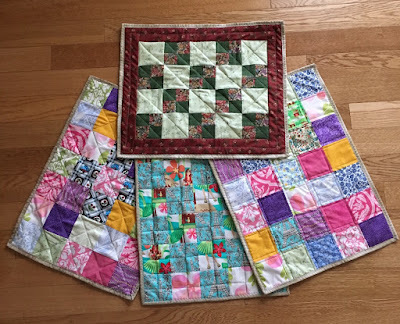 Quilters always have orphan blocks that can be turned into adorable and quick doll quilts. 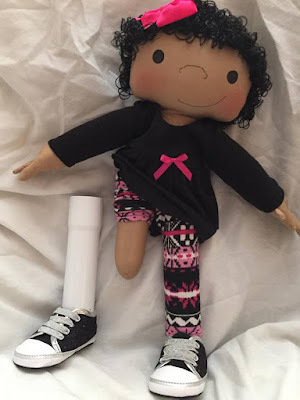 The Doll Like Me project also welcomes knit and crochet doll blankets. If you want to help, contact Amy on the Facebook page. According to the calendar, today is the day! I saw a pair of robins yesterday . 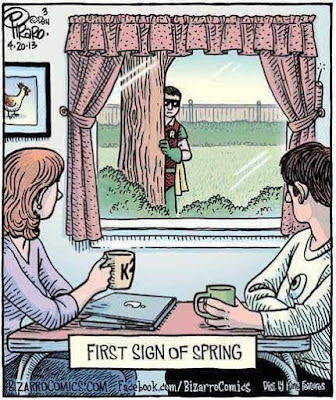 . . spring-like weather will hopefully be here soon. 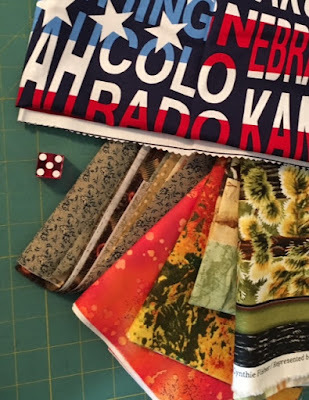 Clue #2 for the Square Dance QAL was released on Friday. 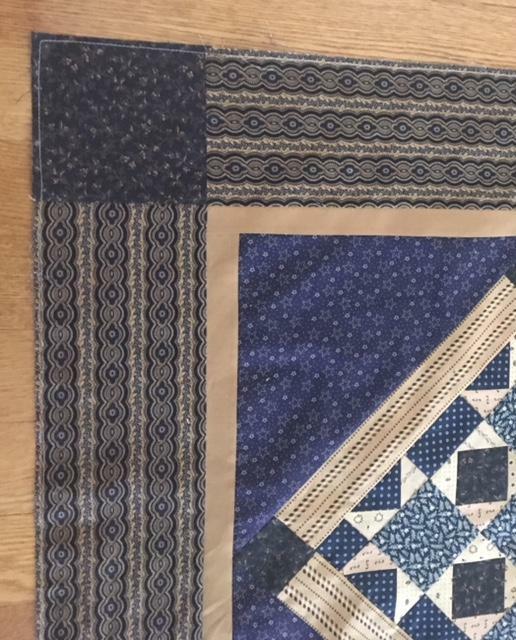 Since the fabric was already cut, the pieces were quickly sewn. 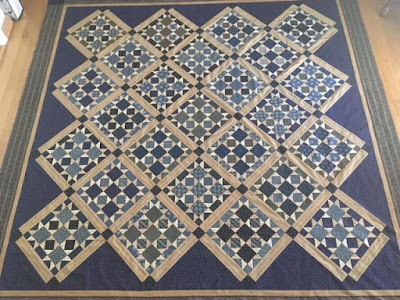 Fifty-six of the blocks are made with 2.5 x 6.5 inch strips, and fifty-six blocks are made from 3 x 7.5 inch strips. All the pieces have been used, so next month the clue will likely be about assembling some larger units. Lately I've been yearning for color, as the landscape is still brown and grey with a bit of the white stuff still visible here and there. I searched my old photos and found these two images from the first trip I made to Hawaii - June 1976. 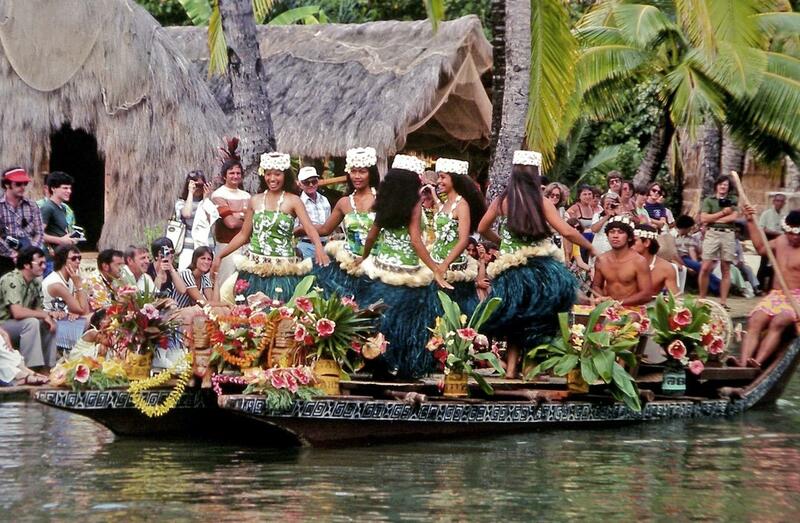 Hawaii is beautiful and colorful - the perfect getaway (even in photos) for a winter weary soul. 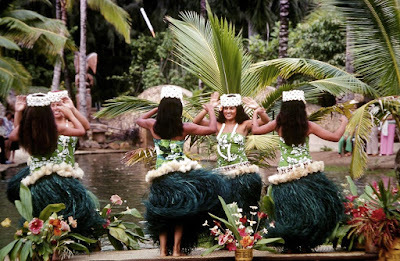 I returned to Hawaii in 1985 and then again in 2010. 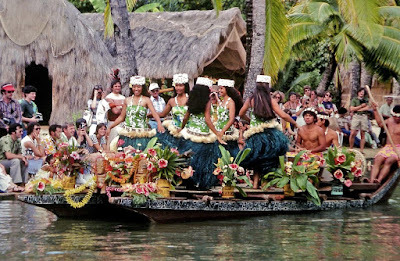 Have you visited Hawaii? Most of the sock yarn in my stash is self-striping, and I enjoy watching the stripes reveal themselves as I knit. The stripes keep me motivated, as I will pull the yarn out of the ball and challenge myself to knit just one more stripe. Ellen gifted this ball of yarn to me, and I love the colors. Thanks again, Ellen! 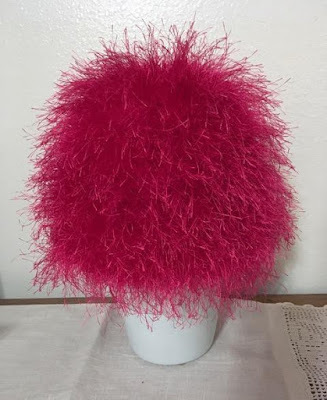 I decided to use the scrap yarn immediately to knit a baby hat. Only a small bit of this yarn remains, and soon it will be combined with other bits to knit another baby hat for donation. Clue #4 produced another set of 9.5 inch rail fence blocks. 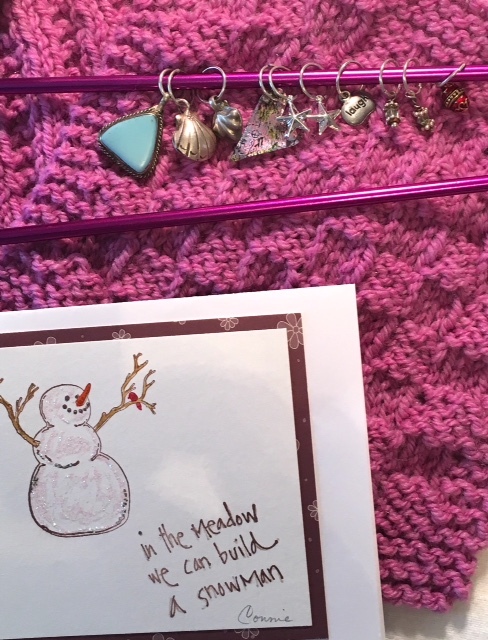 I decided to use both white and red string scraps and made my "rails" irregular. 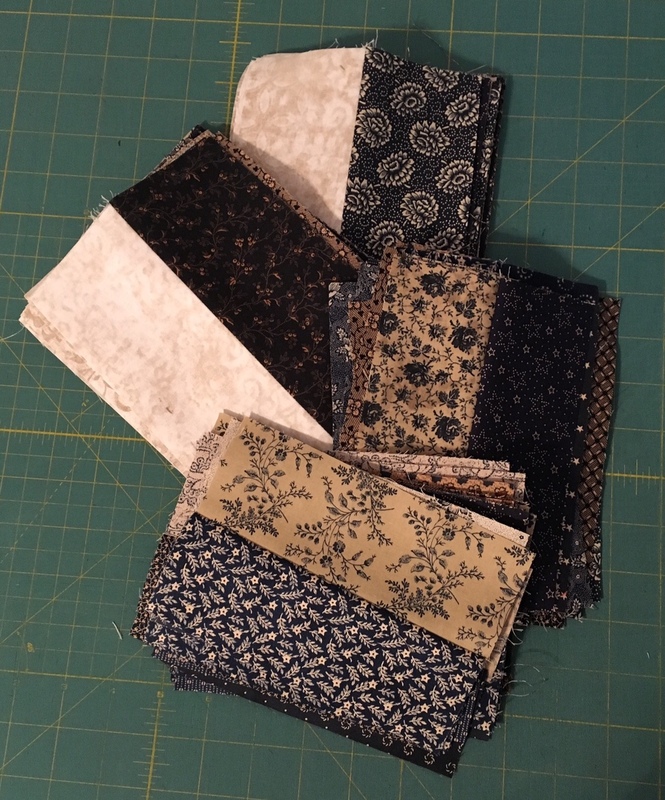 The four 3.5 inch strips of scraps are 30ish and 40ish in length. 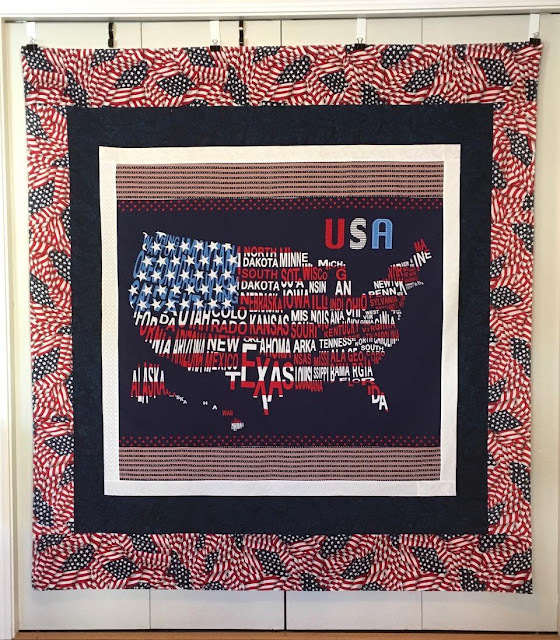 I love how the names fit in the shape of each State. This is first UFO finish for March. 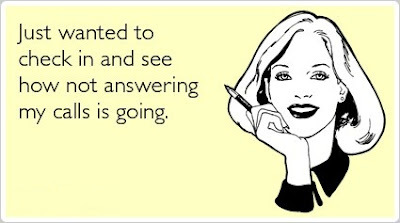 As ridiculous as it seems, I cannot answer my phone if I don't recognize the number on caller ID. I am being besieged with telemarketing calls: forty-five calls in the short month of February, and as of today, I have received 23 calls in March. I registered on the Do Not Call list in 2008, and according to the Registry, my number is still listed. It appears the crooks have outsmarted the authorities once again. The problem is that they change numbers so quickly that they cannot be tracked or even blocked. Some calls I receive are local numbers, and others appear on my caller ID with names I recognize, but they are not those individuals: their numbers have been "cloned." Technology is allowing the telemarketing industry to legally stalk and harass citizens. If someone rang our doorbells two, three, or four times a day, local authorities could deal with them. Ignoring the calls is not working and being on the Do Not Call registry is not working. Disconnecting the phone is the only solution to this frustrating situation; however, I don't want to go to that extreme. How do you handle this annoying problem? Marilyn asked me to roll the die for this month's UFO selection - a five. My #5 UFOs are unfinished Quilts of Valor - a word panel and some wildlife panels. 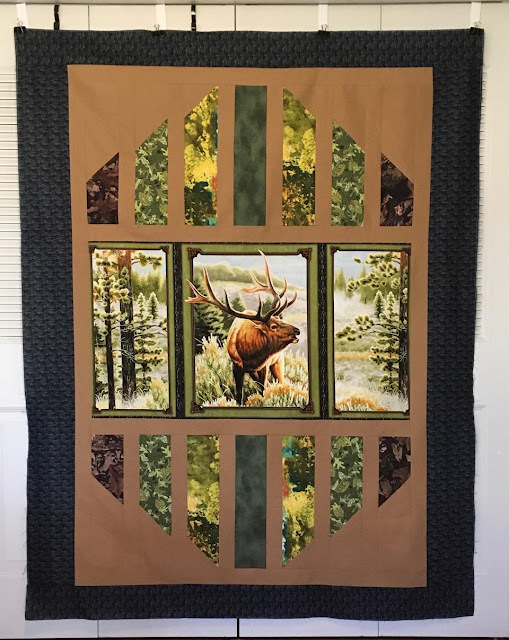 The wildlife panels have been in my stash for over three years. In recent years, more veterans in this area have selected wildlife or hunting related quilts over patriotic quilts. One of my goals in 2018 is to keep my sewing area tidy or at least tidier than it's been in the past. Instead of tossing scraps in a box and dealing with them in the distant future, I'm trying to deal with them once a month. The pieces are pressed and then cut into useable sizes and placed in my scrap bins. As you can see from the labels, I cut the fabric chunks into squares and strips. The condition of these boxes determine when more scrap quilts are created. The 2.5 inch strip bin was once contained in one of the plastic shoe boxes but recently moved into the larger box which is clearly twice as large. I need to bring that box under control. The clear plastic box shown upper left contained single 2.5 inch squares. To clean out that box, I made four-patch units. 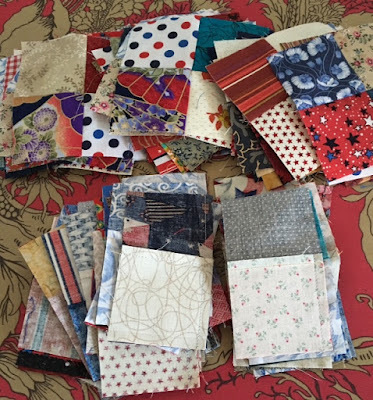 Once they were sewn and pressed, I had over 100 four-patches. I have an idea of how these will be used, but it's on the back burner right now. 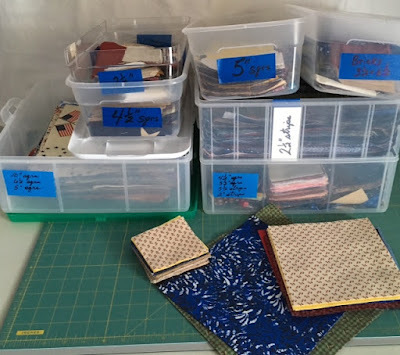 Scrap control is never-ending, but at least the boxes keep the scraps contained and tidy. 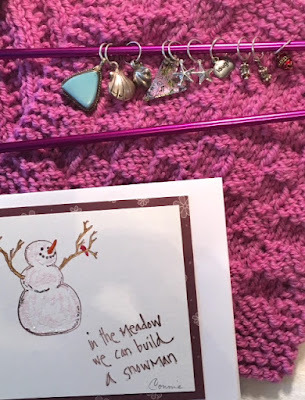 I found a surprise package in my mail last week: a variety of stitch markers made by Far Side (Connie) who lives in Minnesota. 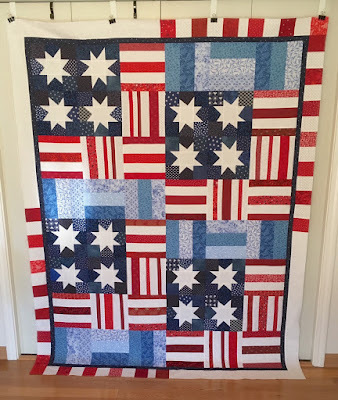 Connie is a multi-talented lady: photography, wood carving, scrapbooking, card making, beading. You may enjoy her two blogs: Far Side of Fifty and Forgotten Old Photos. Thanks, Connie for making my day special.